Movie Review: “Goodnight Mommy” is an Austrian psychological horror-thriller, produced by Ulrich Seidl, and written and directed by Severin Fiala and Veronika Franz. The collaboration between Mr. Seidl and Ms. Franz isn't recent, since the latter was the screenwriter of “Dog Days”, “Import/Export”, and the “Paradise Trilogy: Love, Faith, and Hope”, films that projected the career of Ulrich Seidl as a film director. A careful examination of its wryly-dark tones and incisive procedural techniques can tell us right away that Seidl was an influence. As for the story, it works quite well as a quietly disturbing tale that develops in a crescendo, haunting us with its eerie visuals and baffling us with its mysteries. 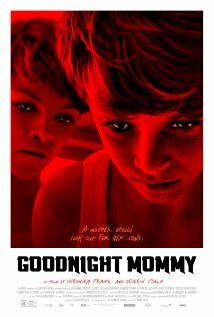 If you liked Lanthimos’ “Dogtooth”, the masterpiece of the genre, you will probably connect to “Goodbye Mommy” whose scenes inside an isolated house in the Austria suburbs, involving the members of a family in a sort of captivity, might provoke similar sensations and claustrophobia. Nevertheless, the plot’s final twist didn’t have the impact that should have had in order to culminate the film in a brilliant way. For me, it worked more like a gimmick than a real twist. Two active and clever twin-brothers, Lukas and Elias, welcome their mother, a TV hostess, after she had been submitted to a facial surgery. Their time is divided into exploring the fields around the isolated house, raising beetles, and feeding stray cats. Gradually, their behavior grows harsh and their posture changes to bitter, after a few incidents that make them suspect about the true identity of their mother who always hides her face under bandages. The situation is aggravated when the intriguing mom sternly communicates the new set of house rules, so she can rest and recover from the surgery, a recent divorce, and an allegedly obscure ‘accident’. Doubt persists till the last act where the kids make their mother a hostage, and the film becomes slightly gory. Neurotically shadowy, “Goodnight Mommy” can provide you with a restless time.